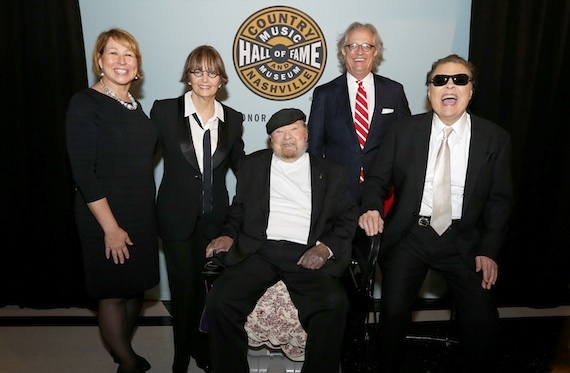 Pictured (L-R): CMA’s Sarah Trahern, Suzi Cochran, Mac Wiseman, Country Music Hall of Fame’s Kyle Young, and Ronnie Milsap. You know you’re in for a grand event when the first person you meet in the lobby is serene goddess Emmylou Harris. And the second person you see is the awesome Bill Anderson at the cocktail reception. 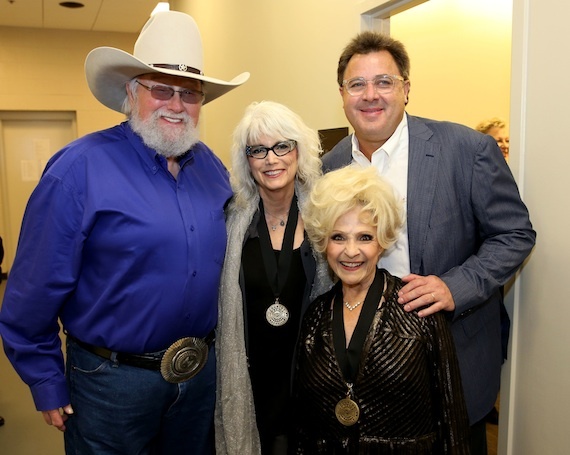 They weren’t the only Country Music Hall of Fame members in attendance. Before the gig even began, we spotted Charley Pride, Brenda Lee, Harold Bradley, Randy Owen of Alabama, E.W. “Bud” Wendell, Bobby Bare, Ray Walker and Curtis Young of The Jordanaires, Charlie McCoy, Vince Gill, Ralph Emery and Jo Walker-Meador. “It’s important that we show up,” said Brenda. 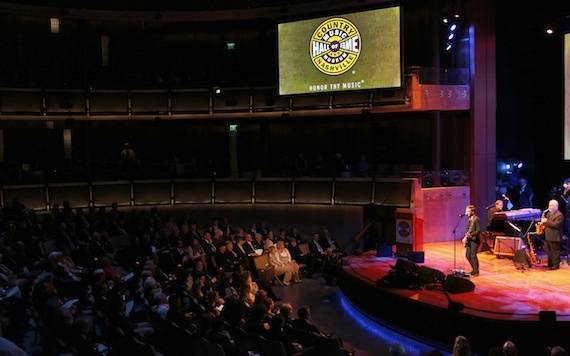 That’s because the event in question was the Medallion Ceremony that officially installed the 2014 inductees into the Country Music Hall of Fame — Mac Wiseman, Ronnie Milsap and the late Hank Cochran. 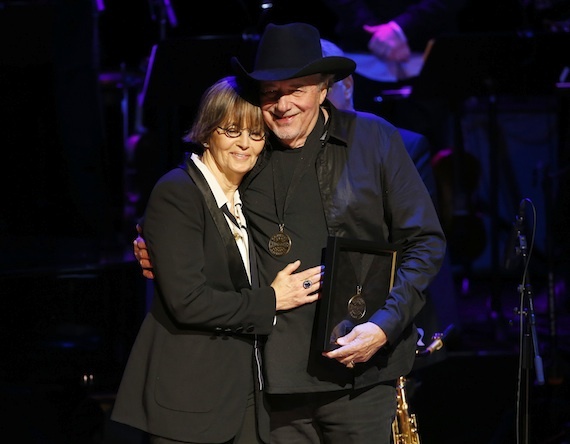 Staged Sunday evening (Oct. 26) at various venues within the Hall of Fame, the Medallion Ceremony maintained its reputation as one of the finest musical evenings on the entertainment industry’s annual calendar. Champagne cocktails and mucho mingling occurred in the Conservatory. Then the actual ceremony took place in the CMA Theater. The cocktail supper afterward was in the new event space, plus its lobby and terrace, on the sixth floor of the museum’s recent addition. “He is known as ‘The Voice With a Heart,’” commented Kyle. “Hard to imagine a more accurate nickname. His dulcet-toned, expressive vocal does more than deliver a song well – it invites the listeners to feel the emotion in the lyrics.” Before launching his solo career, Mac performed with such greats as Molly O’Day, Flatt & Scruggs and Bill Monroe. Jim Lauderdale saluted the honoree with a spirited version of 1951’s “Goin’ Like Wildfire.” Charlie Daniels recalled being a boyhood fan of Mac’s music and sang 1958’s “Jimmy Brown the Newsboy.” One of Mac’s “signature” performances is his sweet, tenor delivery of 1957’s “Tis Sweet to Be Remembered.” Vince Gill’s sweet tenor did the honors on that one. The Ronnie Milsap video featured him performing “What a Difference You’ve Made in My Life,” “(I’m A) Stand By My Woman Man,” “Stranger in My House” and a duet with Ray Charles on “Hey Good Lookin.’” Kyle noted Ronnie’s pop and R&B influences and stated, “Nashville and country music gave his diverse talents a home. 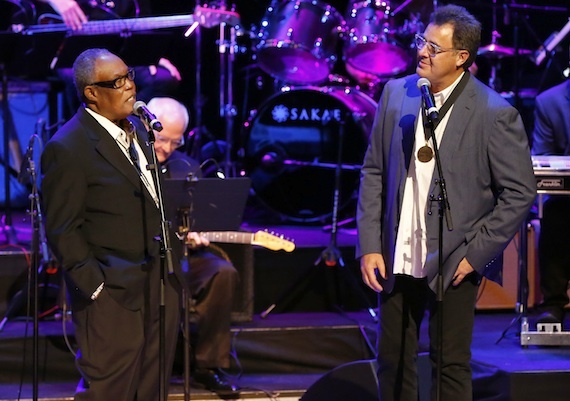 He scored 49 top-10 hits between 1973 and 1991.” Like Mac Wiseman, Ronnie continues to make new music, including the recent CD Summer Number Seventeen. “This is where I come in,” quipped Vince Gill. “We have a new duo. We just got signed – Sam & A Lighter Shade of Dave.” The two drew a standing ovation for “Lost in the Fifties Tonight.” Then Hunter Hayes sang and played dazzling guitar on “(There’s) No Gettin’ Over Me.” Ronnie’s next-door neighbor Martina McBride performed a thrilling “(I’d Be) A Legend in My Time,” ranging from the lowest notes of the song’s bridge to its shimmering-soprano climax. 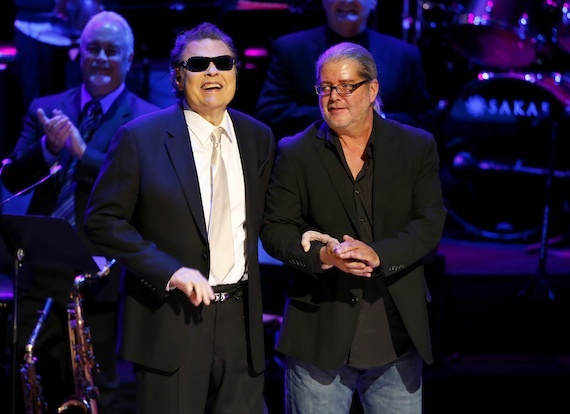 “It is my privilege to welcome Ronnie Milsap into the hallowed Country Music Hall of Fame. I’m comin’ over there [to the other side of the stage] with this medal, and you better bend over.” He did, to accommodate the diminutive Brenda. She hung the medallion around his neck and kissed him. Ronnie sat at the piano and led all the evening’s performers — plus The Bethel UMC Chancel Choir — through his downbeat blues arrangement of “Will the Circle Be Unbroken” Thus, this year’s finale was a whole new kind of train wreck. Among those not trying to sing along were David Briggs, David McCormick, David Ross, David Crow, David Conrad, Dave Pomeroy, David Anderson, Dan Rogers, Dan Hayes, John Lomax III, Jon Freeman, John Grady, Rob Galbraith, Rob Beckham, Tom Corley, Tom Roland, Tom Collins, Pat Collins, Jody Maphis and Rose Lee Maphis. Nashville’s songwriting community was well represented by Mike Reid, Gretchen Peters, Tony Arata, Dallas Frazier, Wynn Varble, Sandy Knox and Norro Wilson. From the Americana world came Paul Burch, Kim Richey, Chuck Mead & Brenda Colladay, Erin Enderlin, Billy Burnette, Bobby Bare Jr. and James House. 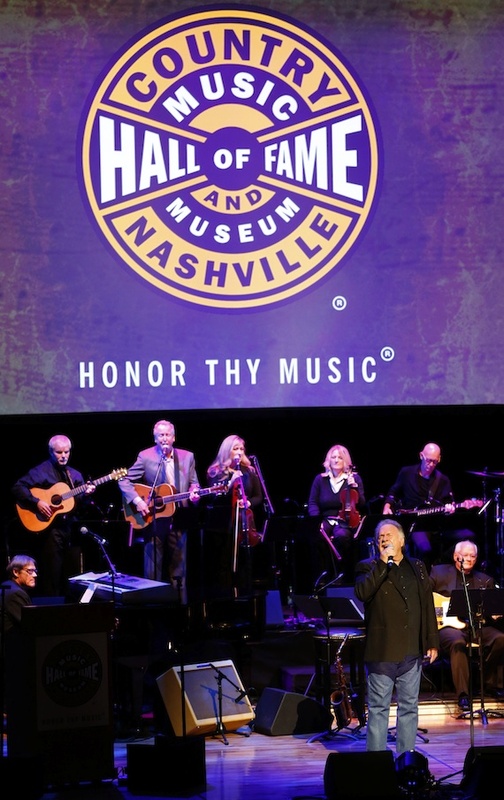 Representing the Grand Ole Opry were Jeannie Seely, Stonewall Jackson, Jan Howard, Keith Bilbrey, Jimmy Capps and Eddie Stubbs. The post-show cocktail supper upstairs featured roast-beef carving stations, squash and/or mushroom ravioli, green salad, mahi-mahi filets, gnocchi, asparagus spears and more. The desert table had truffles, lime mousse, chocolate fondue and fruit. I don’t know if they ate or not, but other music-biz attendees included Fred Foster, Dale Dodson, Les Leverett, Mike Milom, Margie McGahey, Martha Moore, Paul Moore and the colorful mix of Jed Hilly, Jewly Hight, Hunter Kelly, Terry Smith & Nancy Cardwell, Kyle Lehning, Nina Miller, Lori Badgett, Ron Cox, Lisa Harless, Ed Salamon, Frank Bumstead, Lane Brody, Katie Gillon, Chris Horsnell, Joe Galante, Buddy Cannon, Heath Owen, Susan Nadler, Brian Mansfield, Melanie Howard, Tony Conway, Jerry & Connie Bradley, Charlie Cook, Barry Mazor, Anita Hogin and Kevin Lamb. This gig is so prestigious, that many attended from the “civilian” world. These included Rep. Marsha Blackburn, Francis Guess, Kent Oliver, Donna & Gerald Nicely, Jerry Williams, Seab Tuck, Bill Denny and Adam Dread. I cannot close without mentioning the great Bill Cody, who once again emceed the red-carpet arrivals. Nor without citing the Medallion All-Star Band. This year, that was musical director John Hobbs, plus Paul Franklin, Deanie Richardson, Steve Gibson, Biff Watson, Eddie Bayers, Michael Rhodes, Laura Weber Cash, Jeff White and Mark Douthit. “We couldn’t do it without them,” quoth Kyle Young. Amen.